Part 18 of Sports Enthusiasts’ 2015 College Football preview looks at the SEC East in the penultimate preview. As usual, the SEC East is wide open with talented teams and an up and coming team all in the mix. Below are the previews completed and the SEC West preview scheduled for Friday, August 28. Let’s take a closer look at how the SEC East will shake out. Tennessee has fallen on hard times in recent years. Between 2008 and 2012, the Volunteers had four losing seasons with only two bowl appearances and they lost both of those games. Butch Jones came in for the 2013 season after three years at Central Michigan (2007 through 2009) and Cincinnati (2010 through 2012). Tennessee went 5-7 in his first year (2013) and improved to 7-6 in 2014 with smashing 45-28 victory in the TaxSlayer Bowl against Iowa. 2015 provides Jones with his most experienced team. The offense will have 10 starters back, which is double the number from both 2013 and 2014. In 2013, the offense put up 23.8 points and 353 yards per game while that number went up to 28.9 points and 371 yards per game in 2014. The quarterback position was hampered by injuries in 2014 with Joshua Dobbs the top returning guy after throwing for 1,209 yards with 9 touchdowns and 6 interceptions. At running back will be Jalen Hurd (899 yards and 5 touchdowns) and former Alabama commit Alvin Kamara. Dobbs also has some wheels after rushing for 469 yards and 8 touchdowns. The entire receiving unit is back with Pig Howard (54 catches for 618 yards and a touchdown), Von Pearson (38 catches for 393 yards and 5 touchdowns), Marquez North (30 catches for 320 yards and 4 touchdowns), and Jason Croom (21 catches for 305 yards and 4 touchdowns). The offensive line has four starter back and the offense should be able to easily produce the highest numbers under Jones. The defense will have eight starters back from a unit that allowed 24.2 points and 365 yards per game. The defensive line will have two starters back led by Derek Barnett, who was a monster in 2014 with 72 tackles, 10 sacks, and 10.5 tackles for loss. Three linebackers return in Jalen Reeves-Maybin (101 tackles, 2 sacks, and 9 tackles for loss), Curt Maggitt (48 tackles, 11 sacks, and 4 tackles for loss), and Corey Vereen (24 tackles, 1.5 sacks, and 2.5 tackles for loss). The secondary will also have three starters back including both safeties in Brian Randolph (88 tackles and 2 interceptions) and LaDarrell McNeil (76 tackles and 2 interceptions). Cameron Sutton will be at cornerback after recording 37 tackles, 4 tackles for loss, 13 pass breakups, and 4 interceptions. The defense should be even better in 2015, which is a scary thought. Tennessee opens the year with Bowling Green in Nashville before a big game against Oklahoma at home. They will also face Western Carolina and North Texas at home to close out their non-conference schedule. In conference, the Vols will play Florida, Kentucky, and Missouri on the road while staying home to face Georgia, South Carolina, and Vanderbilt. From the West, Tennessee has Arkansas at home and will face their rival Alabama on the road. Despite the tough draw from the West, Tennessee has the ability to win those games and have a great chance against the biggest contenders in the East. Tennessee is the pick to win the East in a surely contentious and open division. Missouri was in the Big 12 Championship in the 2007 season with a chance to make the National Championship, but were demolished 38-17 and ended up being left out of the BCS altogether. The Tigers still had really good seasons in 2008 (10-4) and 2010 (10-3), but began their SEC life with a 5-7 record. That changed in a hurry as the Tigers have been to back-to-back SEC Championship games under Gary Pinkel. The offense took a big step back in 2014 with only 27.8 points and 367 yards per game of output. Compared to 2013, when they put up 39.1 points and 491 yards, it was tough year even with four starters back. 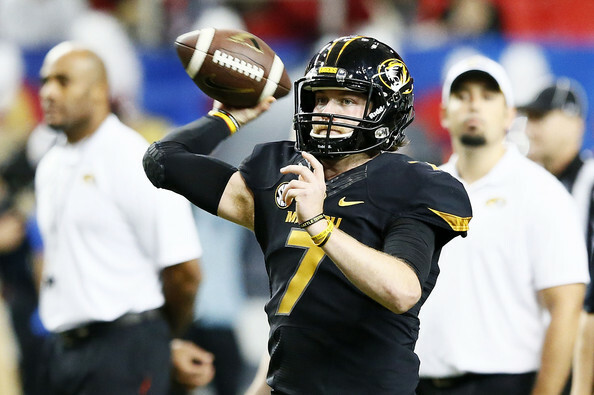 In 2015, there will be six starters back led by quarterback Maty Mauk, who had 2,648 yards with 25 touchdowns and 13 interceptions. Russell Hansbrough returns after rushing for 1,084 yards and 10 touchdowns and Mauk can run the ball if needed as well (373 yards and 2 touchdowns). Wide receiver is a concern with the top four gone. The top returning receiver is tight end Sean Culkin, who had 20 catches for 187 yards and 1 touchdown. Others who may have an impact are J’Mon Moore (2 catches for 33 yards), Nate Brown (5 catches for 45 yards), and Wesley Leftwich (3 catches for 36 yards), but are light on experience. The offensive line will have four starters back, which will create plenty of protection for Mauk and running lanes. The concern is the receivers, but Missouri has the ability to produce higher totals this year despite that. The defense has been very solid the last two years. In 2013, the defense gave up 23.1 points and 418 yards per game while those numbers went down to 21.1 points and 346 yards per game in 2014 (only 4 starters back). There will six starters back in 2015 including the top two tackles. On the line, only Harold Brantley returns after recording 54 tackles, 5 sacks, 2 tackles for loss, and 3 pass breakups. The top tacklers from 2015 reside in the linebacking unit. Kentrell Brothers had 122 tackles, 1 sacks, and 4 tackles for loss while Michael Scherer had 114 tackles and 3 tackles for loss. The secondary has three starters back from a unit that allowed 213 passing yards per game and 60.8% completions. Aarion Penton (36 tackles, 10 pass breakups, and 3 interceptions), Kenya Dennis (61 tackles, 9 pass breakups, and an interception), and Ian Simon (54 tackles and 1 interception) are the returners. The defensive line is the obvious worry, but the Tigers could match last year’s numbers and possibly improve them. The Tigers have only one real test on the non-conference slate. They will face Southeast Missouri State (home), Arkansas State (road), Connecticut (home), and BYU (in Kansas City, Missouri). Within their division, Missouri will face Kentucky, Georgia, and Vanderbilt on the road while playing South Carolina, Florida, and Tennessee at home. They have to play Mississippi State (home) and Arkansas (road) from the West, but they can win both of those games. The schedule sets up well for Missouri to have a serious shot at winning a third straight East Division title and another big bowl game. Georgia is consistently one of the better teams in the SEC under Mark Richt. The Bulldogs have made a bowl game in all 14 years under Richt and have only one losing season in 2010 when they went 6-7. More impressively, Georgia has won at last 10 games nine times with Richt at the helm. The Bulldogs have also won 2 SEC Championship under Richt, however, the last one came in 2005. The Bulldogs went 10-3 in 2014 without Aaron Murray and will look to do the same without their starter from last year. The offense has seven starters back, but as alluded to earlier, Hutson Mason (2,168 yards with 21 touchdowns and 4 interceptions) is not one of them. Brice Ramsey seems to be in line to start (333 yards with 3 touchdowns and 2 interceptions), but he will have competition from Faton Bauta and Greyson Lambert. Nick Chubb will be the top running back after rushing for 1,547 yards with 14 touchdowns while Todd Gurley (911 yards and 9 touchdowns) was hampered by an NCAA investigation and eventually a torn ACL. The top two receivers are gone as well, but Jeb Blazevich (18 catches for 269 yards and 2 touchdowns) and Malcolm Mitchell (31 catches for 248 yards and 3 touchdowns) are set to step up. The offensive line has four starters back, but the losses at quarterback and receiver are worrisome. The Bulldogs put up 41.3 points and 458 yards per game in 2014 and will probably not match that in 2015. The defense was stout last year by giving up only 20.7 points and 337 yards per game with eight starters back. There will be six starters back in 2015 with one starter back on the line in Jordan Jenkins from linebacker. Jenkins had 70 tackles, 5 sacks, and 4.5 tackles for loss. Two linebackers return in Lorenzo Carter (41 tackles, 4.5 sacks, and 2.5 tackles for loss) and Leonard Floyd (55 tackles, 6 sacks, and 2.5 tackles for loss). The secondary will have three starters back from a group that allowed only 170 passing yards per game and 53.8% completions. The trio returning are Aaron Davis (40 tackles, 5 pass breakups, and an interception), Quincy Mauger (51 tackles, 4 pass breakups, and 4 interceptions), and Dominick Sanders (34 tackles, 5 pass breakups, and 3 interceptions). The defense should be solid again and while they may not match or top last year’s numbers, they could come close. Georgia faces Louisiana-Monroe, Southern, Georgia Southern, and Georgia Tech in non-conference action with the only road game against the Yellow Jackets. In conference, Georgia has to face Vanderbilt and Tennessee on the road while playing Florida in Jacksonville, as usual. They will also face South Carolina, Missouri, and Kentucky at home. From the West, Georgia will take on Alabama (home) and Auburn (road) to give them another tough draw. Georgia has the talent to win the East and the division is certainly there for the taking. Since Urban Meyer’s departure after the 2010 season, there have been more bad times than good for the Florida Gators. They went 7-6 in 2011 before a slight resurgence to 11-2 and a Sugar Bowl appearances, but they were crushed in that game and it was all downhill after that. They missed a bowl game entire in 2013 with a terrible 4-8 record and went 7-5 last year. Will Muschamp was in charge for the last four seasons, but he was let go. Jim McElwain has been installed as the head coach after three seasons at Colorado State where he went 22-16. The offense in 2013 for Florida was atrocious. They put up a paltry 18.8 points and 317 yards per game while the numbers improved drastically in 2014 with 30.3 points and 368 yards per game. Enter McElwain, who nearly 35 points and 500 yards per game in his final two years at Colorado State. The quarterback position was unsettled last year due to injuries, suspensions, and ineffectiveness. Treon Harris threw for 1,019 yards with 9 touchdowns and 4 interceptions, but will be competing with Will Grier for the QB duties. The running back position is led by Kelvin Taylor, who had 565 yards and 6 touchdowns, but the loss of Adam Lane (181 yards and 1 touchdown) will hurt the depth. Demarcus Robinson (53 catches for 810 yards and 7 touchdowns) was the top receiver last year and returns for 2015 along with Ahmad Fulwood (12 catches for 199 yards and a touchdown), Latroy Pittman (15 catches for 164 yards), and Brandon Powell (15 catches for 147 yards and a touchdown). There is only one offensive lineman returning and the offense is also learning new schemes. With all that in mind, it is tough to see the Gators putting up a high amount of points, but there is serious talent left over from Muschamp’s tenure. The defense was very good to excellent under Muschamp, which is no surprise. In 2012, the defense allowed 14.5 points and 287 yards per game in their 11-2 season. The numbers rose to 21.1 points per game in both 2013 and 2014 while the yards per game were 314 in 2013 and 330 in 2014. This year, there will be seven starters back with two on the line in Bryan Cox (29 tackles and 4 sacks) and Jonathan Bullard (52 tackles, 2.5 sacks, and 6 tackles for loss) while highly rated freshman Cece Jefferson. Antonio Morrison is the lone linebacker returning, but he is a good one after leading team in tackles with 101. The secondary is clearly the strength of the defense with all four starters back led by Vernon Hargreaves (50 tackles, 13 pass breakups, and 3 interceptions). Brian Poole (45 tackles, 10 pass breakups, and 4 interceptions), Keanu Neal (45 tackles and 3 interceptions), and Marcus Maye (62 tackles) all return as well. The secondary should be one of the best, if not the top, secondaries in the nation. Overall, the defense should be stout again with that back four leading the way. Florida faces New Mexico State, East Carolina, Florida Atlantic, and Florida State as part of their non-conference schedule and all four of those games are at home. Within their division, Florida faces Kentucky, Missouri, and South Carolina on the road while playing both Tennessee and Vanderbilt at home. The Gators also face Georgia in their annual clash in Jacksonville. From the West, Florida will play Ole Miss (home) and LSU (road) in two tough games. The talent is there for the Gators to win the East, but a new coach and some losses on the offense leave some worries about actually getting it done. It is hard to believe that Steve Spurrier will be entering his 11th year at South Carolina. He has led South Carolina to an overall record of 84-45 and has not had a losing season. However, the Gamecocks have not won the SEC Championship and have only played in the SEC Championship game once in 2010 when they were lit up 56-17. Still, South Carolina had three straight years of 11-2 records from 2011 through 2013 and Spurrier looks to get them back to those heights after a 7-6 record in 2014. The offense put up 32.6 points and 443 yards per game, but will only return four starters from last seasons. The quartet of Connor Mitch, Perry Orth, Lorenzo Nunez, and Michael Scarnecchia will battle it out to replace Dylan Thompson (3,564 yards with 26 touchdowns and 11 interceptions). The top returning rusher is Brandon Wilds (570 yards and 4 touchdowns) and he will be joined by David Williams (256 yards and 2 touchdowns) and Shon Carson (141 yards with 2 touchdowns). Pharoh Cooper returns at wide receiver after leading the team in 2014 with 69 catches for 1,136 yards and 9 touchdowns. Tight end Jerell Adams is the second leading returning receiver with 21 catches for 279 yards and 1 touchdown. There are three starters back on the line as well. The lack of experience is a huge concern for the offense and the last time this few of starters returned, they only put up 20.6 points and 347 yards per game. The defense is in better shape than the offense with eight starters returning including three on the offensive line. The duo of Gerald Dixon (42 tackles and 2 sacks) and Gerald Dixon Jr. (29 tackles) will be joined by Darius English (24 tackles) and junior college transfer Marquavius Lewis. The top three linebackers return in Skai Moore (93 tackles and 3 interceptions), TJ Gurley (80 tackles), and Jonathan Walton (61 tackles). The secondary is the concern here with two starters back in Chris Lammons (21 tackles) and Chris Moody (37 tackles). The defense allowed 30.4 points and 433 yards per game in 2014, but those numbers should improve in 2015 with more experience returning. South Carolina opens the year with a game against North Carolina in Charlotte, North Carolina. Their three other non-conference games are against Central Florida, The Citadel, and Clemson with all of those games at home. They will face Georgia, Missouri, and Tennessee on the road in three tough games while playing Kentucky, Vanderbilt and Florida at home. From the West, the Gamecocks have LSU (home) and Texas A&M on the road. If the offense can get its act together quickly and perform well above expectations, then South Carolina has a great chance at contending in the East. Kentucky has been a middle of the road SEC team at best for a long while. With Joker Phillips at the helm, the Wildcats went 6-7 in year one before falling off to 5-7 and 2-10 in his final two years. Mark Stoops was brought in and produced the same 2-10 record in his first year. 2014 was a step in the right direction with a 5-1 that included a brutal triple overtime loss to Florida, 36-30. They finished the year with six straight losses preventing them from making a bowl game. Kentucky’s offense put up 29.2 points and 384 yards per game in 2014, a step up from the 20.5 points and 341 yards per game they produced in 2013. This year, seven starters are back led by quarterback Patrick Towles, who threw for 2,718 yards with 14 touchdowns and 9 interceptions. The running game has Stanley Williams back after he ran for 486 yards and 5 touchdowns as the leading rusher, though that will need to go up in 2015. Jojo Kemp (323 yards and 4 touchdowns) and Mikel Horton (306 yards and 2 touchdowns) are also at running back. Ryan Timmons is back after leading the team with 45 receptions for 536 yards and 2 touchdowns. Also returning are Garrett Johnson (22 catches for 271 yards and 2 touchdowns), Dorian Baker (19 catches for 199 yards and 1 touchdown), and Blake Bone (14 catches for 194 yards with 2 touchdowns). The offensive line has four starters back and the offense should continue its upward trend in points and yards per game in 2015. The defense has been consistently sub par in Stoops’ first two years. In 2013, the defense gave up 31.2 points and 427 yards per game and those numbers were nearly the same in 2014 when they allowed 31.3 points and 407 yards per game. In 2015, the number of starters returning is seven including four of the top six tacklers. On the line, Melvin Lewis is the lone returning starter after recording 37 tackles last year. The three linebackers all return in Ryan Flannigan (57 tackles), Khalid Henderson (53 tackles), and Josh Forrest (110 tackles and 7 tackles for loss). The secondary has three starters back led by Cody Quinn (35 tackles), Fred Tiller (46 tackles, 9 pass breakups, and 2 interceptions), and AJ Stamps (56 tackles and 4 interceptions). Year three of the Stoops era should produce the best defense yet. Kentucky has a non-conference schedule that consists of Louisiana-Lafayette, Eastern Kentucky, Charlotte, and Louisville with all those at home. They will face South Carolina, Georgia, and Vanderbilt on the road while taking on Florida, Missouri, and Tennessee at home. From the West, Kentucky will play Auburn (home) and Mississippi State (road). Kentucky is the wild card team in the East due to their ability to completely shake up the standings. Vanderbilt was undoubtedly going in the right direction under James Franklin. He led them to three straight bowls between 2011 and 2013 while going 9-4 in his final two years. Unfortunately, Derek Mason was not able to produce the same results in his first year with Vanderbilt going backward to 3-9 including 0-8 in the SEC last year. The offense for Vandy in 2014 was poor gaining only 288 yards per game and scoring just 17.2 points per contest. There will be in starters back from that group led by quarterback Johnny McCrary, who was the leading passer in 2014 with only 985 yards with 9 touchdowns and 8 interceptions. Wade Freeback threw for 365 yards with 1 touchdown and 5 interceptions. At running back will be Ralph Webb, who was a bright spot as a freshman with 912 yards and 4 touchdowns. The top three receivers are back in Steven Scheu (39 catches for 525 yards and 4 touchdowns), CJ Duncan (28 catches for 441 yards with 4 touchdowns), and Latevius Rayford (36 catches for 350 yards and a touchdown). The offensive line has four starters back and the offense should produce better in 2015. The defense has nine starters back from a group that allowed 33.3 points and 402 yards per game. There are two back on the line led by Caleb Azubike (39 tackles and 4 sacks) and Adam Butler (35 tackles, 2.5 sacks, and 5 tackles for loss). The linebackers have three returning starters in Nigel Bowden (78 tackles), Stephen Weatherly (55 tackles, 4.5 sacks, and 8 tackles for loss), and Darreon Herring (45 tackles). The secondary has all four starters back with Torren McGaster leading the way with 66 tackles and 2 interceptions. The defense should improve in 2015 with the experience and depth returning. Vanderbilt will play Western Kentucky, Austin Peay, Middle Tennessee, and Houston with the first two at home and the second two on the road. In their division, Vandy will take on South Carolina, Florida, and Tennessee on the road and play Georgia, Missouri, and Kentucky at home. From the West, they will play Ole Miss (road) and Texas A&M (home). Vanderbilt will be struggling for wins again in 2015, but they will be a tough out in some games this year. The SEC East is wide open with Tennessee, Missouri, Georgia, Florida, and South Carolina all having enough talent to win the division. Kentucky is a dangerous team that can spoil the hopes of any of the top five teams with an upset while Vanderbilt is still lagging behind. Below is the predicted order of finish. Check back on Friday for the final preview of this series with the SEC West. We will also predict the winner of the SEC Championship.